Age UK will use stars from the popular Channel 4 show Gogglebox in the next phase of its Christmas campaign during the ad break for tonight's episode. Created by Studio Lambert and The Outfit, Channel 4’s creative team, the ad sees Gogglebox regulars June and Leon Bernicoff reacting to an Age UK direct response ad which airs during the first ad break of the show tonight. The Age UK ad, created by Open Fundraising, features an elderly woman looking at a photo album, with her voiceover explaining how she is alone. It was written by James Briggs, the managing director of Open Fundraising. It marks the next stage of the charity’s "no one should have no one at Christmas" activity, which began by aligning with this year’s festive ad by John Lewis, "man on the moon". 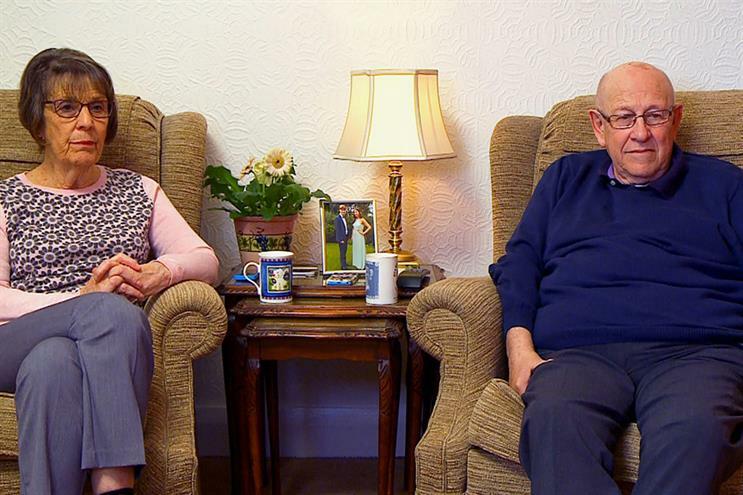 The Gogglebox-style ad, featuring June and Leon, is described as an emotional affair in which the husband and wife react to the Age UK commercial by talking about how they have always looked after each other. Manning Gottlieb OMD handled the media. Esther Jackson, the marketing and fundraising director at Age UK, said: "Gogglebox is an incredibly powerful medium and we hope this collaboration will help us to highlight the issue of loneliness with a wide audience in a way that resonates and creates a real emotional connection. "Loneliness can be devastating and mounting evidence shows it has a serious impact on a person’s mental and physical health. Through our campaign, and with the help of June and Leon, we aim to tackle this issue and provide older people with vital support and companionship, which can be life-changing." "Man on the moon", created by Adam & Eve/DDB, launched on 6 November and told the story of a young girl who brings Christmas to a lonely old man living on the moon.